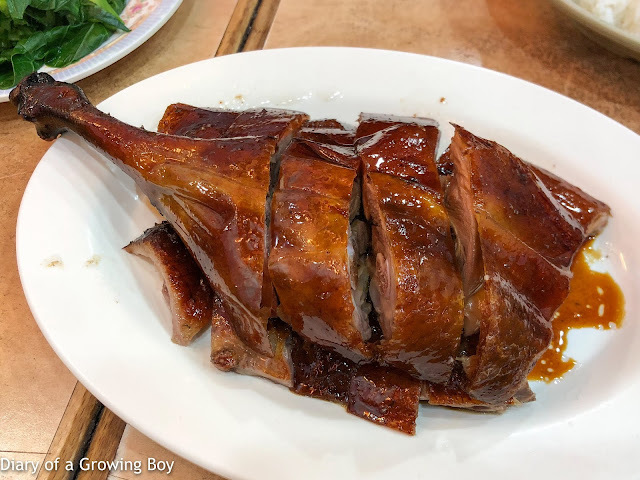 I wasn't sure we could finish half a goose, so I just ordered up a lower quarter of roast goose (燒鵝下庄). Still love that crispy skin with the seasoning, and the Parental Units liked it, too. 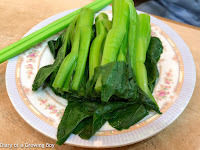 I wasn't sure how hungry mom was, but I knew she would always be up for some veggies, so I got a plate of choy sum (菜心) that's simply blanched and without any seasoning. But as it turns out, there wasn't enough food for the four of us. Besides, they now have a minimum spend of HKD 60 per head, which has gotta be something new... 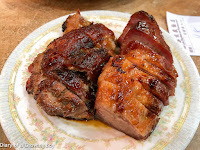 So we took a plate of barbecued pork (叉燒). Half the plate was lean and a little dry, while the other half was fatty and tasty. 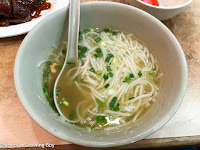 A pretty good lunch, and we all left with smiles on our faces.